Most people resort to the use of medicinal herbs or a strict low-salt diet as natural ways to lower high blood pressure. However, did you know that a towel can also be used to lower your hypertension? Bring out a towel and roll it up like shown on the picture below. 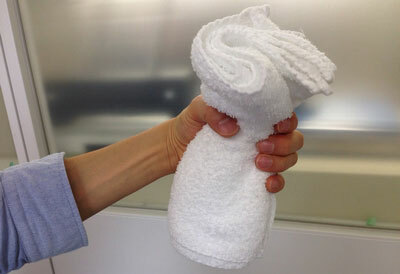 While holding the middle portion of the towel, squeeze it as hard as you can. Use 100% of your strength and remember this feeling for your reference. Gradually decrease your strength down to about 30%. For two minutes, squeeze the towel using 30% of your strength. Perform the above procedures twice both on your left and right hands. Do these three times a week. By doing this hand grip exercise using towel, in combination with low-salt diet and aerobic exercise, you will eventually see a decrease in your blood pressure naturally right at the comfort of your home. For best results, the thickness of the towel should be enough so your thumb won't be touching the rest of your fingers while squeezing the towel tight. 1. Hold and squeeze for two minutes and rest for one minute. 2. Perform the exercise twice with your left hand and twice with your right hand. How Can Hand Gripping Lower Your Hypertension? Research shows that when hand gripping restricts blood flow in the forearms, a powerful natural dilator, nitric oxide, is released by the arteries, which helps lower the blood pressure. You typically need about a month of doing this hand grip exercise before you'll see significant reduction in your blood pressure. Hand gripping using towel can be very handy especially to those who have injured legs and are in the hospital and cannot do aerobic exercises. Important: Please consult your doctor before doing hand grip exercise if you have severe hypertension (180/110mmHg or more). 1. "How to Prevent Stroke Caused by Undetected Hypertension"
2. "Grow Your Own Sweet Potato and Lower Your Hypertension"
3. "Are You Suffering from Mysterious High Blood Pressure?"